There are many opportunities for residents to engage in clinical, quality improvement and basic science research at Virginia Mason. Our faculty supports residents throughout all stages of the research process, from obtaining Institutional Review Board (IRB) consultation to polishing oral case presentations. 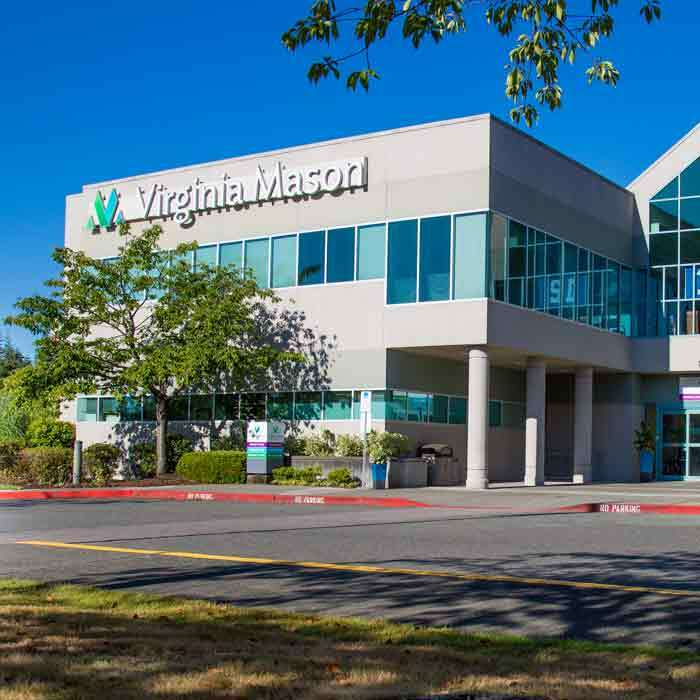 Virginia Mason is home to Benaroya Research Institute (BRI), which is an international leader in immune system and autoimmune disease research, translating discoveries to real life applications. BRI is one of the few research institutes in the world dedicated to finding causes and cures to eliminate autoimmune diseases including: type 1 diabetes, arthritis, lupus, multiple sclerosis, scleroderma and many others. There are many opportunities for residents to get involved in BRI projects. The Center for Health Care Improvement Science is a center developed to perform and publish health services investigations of Virginia Mason quality, safety and improvement initiatives. Residents are encouraged to participate in systems-improvement research, and can receive publication support through the experts at the Center. The ongoing systems-improvement work at Virginia Mason offers endless opportunities for systems-based improvement research. Virginia Mason is particularly known for quality improvement activities supported by the Virginia Mason Production System, and our residents are uniquely positioned to be involved in quality improvement research. Many residents get involved in scholarly work related to quality improvement activities. A project team of physicians, laboratory personnel, an information technology specialist, and two industrial engineering students designed an intervention to prevent unnecessarily morning lab draws: an “AM Lab Holiday” order. This electronic order appeared in an “AM lab” order set and allowed the primary provider to communicate to the nurse and other team members that morning labs did not need to be drawn. Following implementation of the new order, 1,513 “AM Lab Holiday” orders were placed by 83 different providers in the 7-month post-intervention period. Overall, lab draws per week decreased by 5.4 percent, and morning lab draws per week decreased by 7 percent, suggesting that the new order was an effective way of decreasing unnecessary lab draws. At Eastgate Public Health Center, where many of our residents practice continuity clinic, residents faced challenges in managing their lab results in a timely manner. 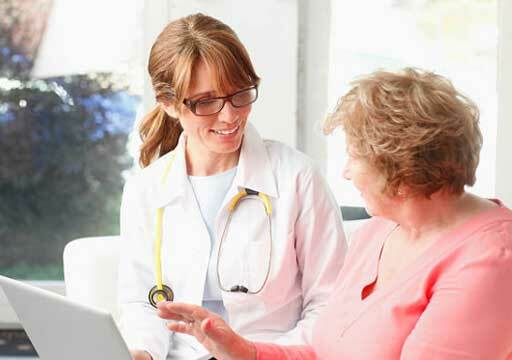 No back-up system for managing results existed, and patients experienced long wait times for their results to be acted on due to the lack of training and standards, off-site location, separate EMR system, and long absences from clinic during inpatient rotations. A project team of residents and attendings designed a three-pronged intervention to decrease lead times and standardize management of lab results, including a standard algorithm for results reporting, an inbox coverage system for residents out of clinic, and a checklist-based training system for new interns. Post-intervention, lead times to acting on lab results decreased by 63 percent, labs in processed decreased by 81 percent, and new interns were trained on 94 percent of essential clinic skills within two months of starting residency. 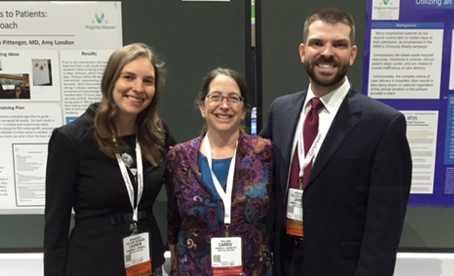 Lauren Powell, MD, MBA (Class of 2017) and James Barlow, MD (Class of 2017) present their scholarly work at National ACP, supported by Dr. Carrie Horwitch, core faculty and scholarly project advisor. First Place Winner, Innovations Trainee Award. Society of Hospital Medicine Annual Conference 2016. In 2014, we recognized that the pace of admissions frequently exceeded our ability to assign a hospitalist. Long patient wait times occurred at admission, especially for patients arriving in the late afternoon when hospitalist day shifts were ending. Our purpose was to redesign hospitalist schedules, duties and method of distributing admissions to match demand. Using administrative data, we were able to estimate demand of admissions by time of day and identify mismatch between volume and capacity with the current staffing model. A team of hospitalists, residents, and administrators designed a new staffing model around demand, which increased admitting capacity and decreased patient wait times for admissions. 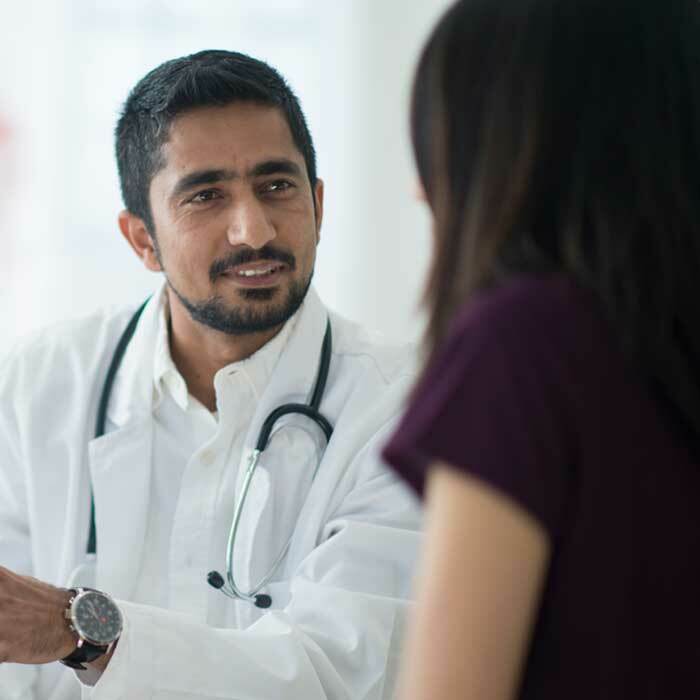 Our residency program is a member of the Alliance of Independent Academic Medical Centers (AIAMC), an organization that coordinates nationwide initiatives for member programs to conduct 18-month projects on a specific theme. For the 2016-17 AIAMC National Initiative V, our team chose to engage with the organizational goal of improving care of patients misusing alcohol. Prior to our intervention, screening for alcohol misuse was not standardized, using non-validated questions and documented inconsistently. Through multiple PDSA cycles we were able to implement standard screening at all primary care annual exams using a validated single question. Because clinicians indicated a lack of comfort in managing alcohol misuse, we also created tools for responding to a positive screen, including a patient education handout and an evidence-based note template guiding appropriate medications, vaccinations, and additional screening for those misusing alcohol. 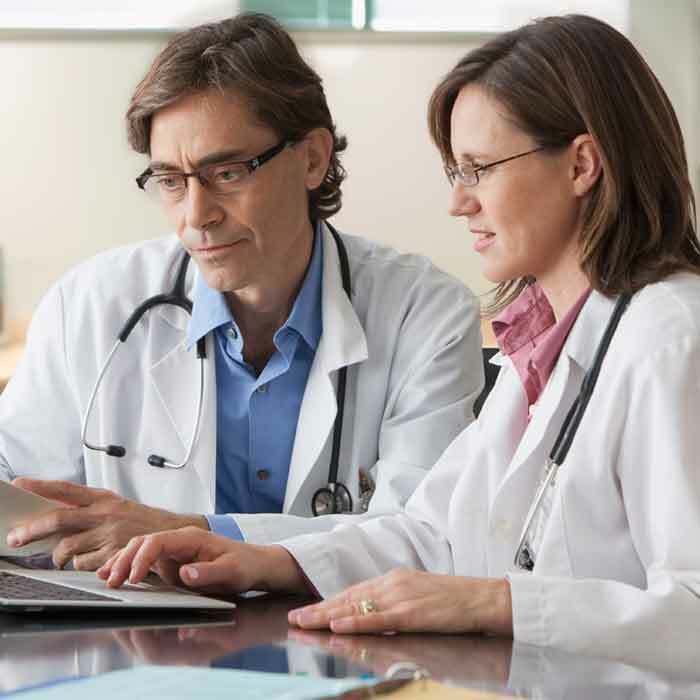 The process we developed at one initial site has become standard work at all primary care clinics across Virginia Mason. Amy Thomson, MD, (Class of 2016) and Carly Magnusson, MD, (Class of 2017) presenting their work on alcohol screening at the AIAMC National Meeting in Amelia Island, Fla., in March 2017. Below is a list of selected recent resident publications and presentations by Virginia Mason internal medicine residents. Gulvin J, Rosales J. Using a QOPI-based template to monitor appropriate evaluation of constipation. J Clin Onc 34, 2016 (suppl 7S; abstr 94). Gulvin J, Aboulafia DM. Squamous Cell Cancer of Unknown Primary and Primary Breast Cancer in an HIV-Infected Woman: The Importance of Cancer Screening in People Living with HIV/AIDS. J Int Assoc Provid AIDS Care. 2016 May;15(3):194-200. Johnson C. Teaching improvement: quality improvement curriculum for residents. VM Bulletin 2015; 69(2)21-24. 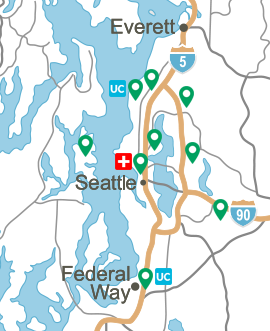 Schweitzer S. et al. Patient satisfaction with information delivery in the hospital: a quality improvement pilot study. VM Bulletin 2015; 69(2);25-29. Ericson S, Shah N, Liberman J, Aboulafia DM. Fatal bleeding due to acquired factor IX and X deficiency: a rare complication of primary amyloidosis; case report and review of the literature. Clin Lymphoma Myeloma Leuk. 2014;14(3):e81-6. Maldonado L, Brait M, Loyo M, Sullenberger L, Wang K, Peskoe SB, Rosenbaum E, Howard R, Toubaji A, Albadine R, Netto GJ, Hoque MO, Platz EA, Sidransky D, GSTP1® promoter methylation is associated with recurrence in early stage prostate cancer. The Journal of Urology. 2014:192(5):1542-8. Meier DT, Morcos M, Samarasekera T, Zraika S, Hull RL, Kahn SE. Islet amyloid formation is an important determinant for inducing islet inflammation in high-fat-fed human IAPP transgenic mice. Diabetologia. 2014: 57:1884-8. O’Neill, DF. PrEP Yourself: Making Better Sense of the Pre-Exposure Prophylaxis Debate. The Huffington Post: Gay Voices Section. Published online: 25 April 2014. Maxwell KL, Kowdley KV. Metals and the liver. Curr Opin Gastroenterol. 2012 May; 28(3):217-22. Snyder SM et al. Hyperbaric oxygen and reduction mammaplasty in the previously irradiated breast. Plast Reconstr Surg. 2010;125(6):255e-7e. Story B, Thirlby R, Schembre D. Diagnosis of ileal dysplasia in a patient with Crohn's disease by using retrograde enteroscopy with an overtube;a case report. Gastrointest Endosc. 2011;73:178-9. Ochenrider MG et al. Hepatosplenic T-cell lymphoma in a young man with Crohn's disease: Case report and literature review. Clini Lymphoma Myeloma Leuk 2010;10:1440-48. Dever JB et al. Outcomes of interventional ERCP in hereditary pancreatisis. J Clin Gastroenterol 2010;44:46-51. 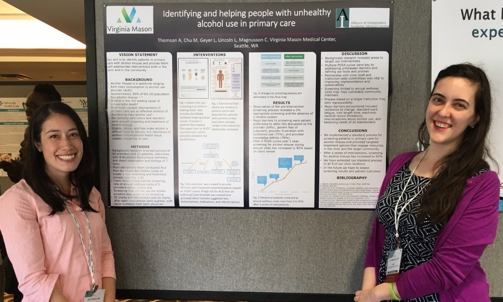 Thomson A, Chu M, Geyer L, Lincoln L, Magnusson C. Identifying and helping people with unhealthy alcohol use in primary care. Poster presentation. Alliance of Independent Medical Centers Annual Meeting, April 2017. Amelia Island, FL. Powell L, Batik O, Pittenger K. Delivering Timely Lab Results to Patients: A Team-Based Approach. Poster presentation. Washington State ACP Annual Meeting. Nov 2016. Seattle, WA. Poster presentation winner. Wells, Monika. Adrenal crisis presenting as acute severe hypoglycemia. Poster presentation. Washington State ACP Annual Meeting. Nov 2016. Barlow JL, Gerbino AJ, Holm JR. Severe immersion pulmonary edema in a diver requiring endotracheal intubation. Poster presentation. Undersea Hyperbaric Medical Society Annual Scientific Meeting. June 2016. Las Vegas, NV. Barlow JL, Mehta AM, Fagley RE. Clinical course and treatment of systemic capillary leak. Poster presentation. American Thoracic Society International Conference. May 2016. San Francisco, CA. Booras D. Utility of emergency department CT Scans in patients with ulcerative colitis. Poster presentation. Digestive Disease Week; San Diego, CA and at United European Gastroenterology week. 2016. Vienna, AUT. Parsons T. Delayed paracentesis and spontaneous bacterial peritonitis – no increase in mortality. Poster presentation. Society of Hospital Medicine (SHM) Annual Meeting. March 2016. San Diego, CA. Wells M, Coates E, Calderon A, Blackmore C, Williams B. Designing hospitalist shifts around admission demand reduces patient wait times, cost, and resident duty hour violations. Poster presentation. Society of Hospital Medicine Annual Conference. Mar 2016. San Diego, CA. 1st place winner of Innovations Trainee Award. Kane Z. Hoffman’s syndrome: a polymyositis like illness. Poster presentation. Washington State ACP Annual Meeting. Nov 2015. Seattle, WA. heparin-induced thrombocytopenia. Poster presentation. Washington State ACP Annual Meeting. Nov 2015. Seattle, WA. Poster presentation winner. Thomson A. Gastrointestinal amyloidosis in an IV drug user. Poster presentation. Washington State ACP Annual Meeting. Nov 2015. Seattle, WA. Triska I. E. coli bacteremia in the setting of Strongyloides stercoralis hyperinfection syndrome. Poster presentation. Washington State ACP Annual Meeting. Nov 2015. Seattle, WA. Blayney M. Management of pancreaticopleural fistula: the Virginia Mason experience. Poster presentation. Washington State ACP Annual Meeting. Nov 2014. Seattle, WA. Fang A. A Rarely Confirmed Diagnosis with a Classic Presentation: Primary Systemic Amyloidosis (AL) with Tissue-Proven Cardiac Involvement. Poster presentation. Society of General Internal Medicine. February 2013. Portland, OR and ACP Annual Meeting April 2013. San Francisco, CA. Ghosh, T. The 40 year old IUD: actinomyces mimicing a gyncecologic malignancy. Poster presentation. Washington State ACP Annual Meeting. Nov 2013. Seattle, WA. Jensen A. Amyloid cardiomyopathy causing heart failure. Poster presentation. Washington State ACP Annual Meeting. Nov 2013. Seattle, WA. Shih W H. Calcific uremic arteriolopathy (calciphylaxis) in a woman with end stage renal disease after initiating peritoneal dialysis. Poster presentation. Society of General Internal Medicine. February 2013. Portland, OR. Ward, DJ and DF O'Neill. Nucleoside-Sparing Antiretroviral Regimens in Clinical Practice. Poster presentation. Interscience Conference on Antimicrobial Agents and Chemotherapy. September 2013. Denver, CO.
Parker J. Nitrofurantoin induced respiratory failure. Poster presentation. Washington State ACP Annual Meeting Nov 2012. Seattle, WA. Maxwell K. Abdominal mass in a young patient with juvenile rheumatoid arthritis. Poster presentation Washington State ACP conference Nov 2011. Seattle WA. Liskey D. Kaposi sarcoma presenting as a large bowel obstruction. Oral presentation. Washington State ACP Annual Meeting. Nov 2016. Seattle, WA and National ACP April 2017, San Diego, CA. Magnusson C. An unforgettable business trip: a case of anterograde amnesia. Oral presentation. Washington State ACP Annual Meeting. Nov 2016. Seattle, WA. Cunningham E. Chronic care management during residency implementing a diabetes metric tracking system. Oral presentation. Grand Rounds presentation. April 2016. Virginia Mason Medical Center. Seattle, WA. Popko L. Case of thrombophlebitis of the internal jugular vein misdiagnosed as meningitis. Oral presentation. Grand Rounds presentation. April 2016. Virginia Mason Medical Center. Seattle, WA. Sullenberger L, Shenoy A. Silent disparity-health literacy enhancing provider awareness. Oral presentation. Grand Rounds presentation. May 2015. Virginia Mason Medical Center. Seattle, WA. Parsons, F. New Technologies: Apps for Patients. Oral presentation. Washington State ACP Annual Meeting. November 2014. Seattle, WA. Lee T. Case of anti-NMDA receptor encephalitis in a young woman with worsening cognitive function and psyhcomotor retardation. Oral presentation. Washington State ACP conference. Nov 2011. Seattle, WA.